This happy frog loves to eat in the bath! 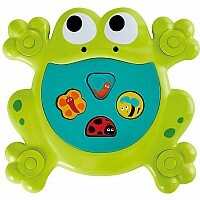 As children feed him insect-shaped puzzle pieces, they will also learn about shapes. Then store the pieces and your other bath toys in the net for next time. Includes circle, semi-circle, triangle and butterfly shapes with insect graphics. Helps children learn about shapes and frog eating habits. For ages 12 months and over. Measures approximately: 11.81 x 11.81 x 2.17 inches..